Michael Bellantoni may be stepping away from his business, but he’s not slowing down. After 50 years of running his landscaping business, Michael Bellantoni might be on the back nine. Or he might be in Hawaii or Florida or Aruba. But even as he winds down his role in the business, rest assured, he will not sit back and simply watch the grass grow. 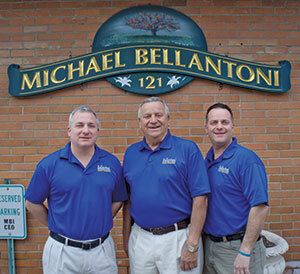 Michael Bellantoni (center) is flanked by his two sons who work with him in the business: Matthew (left), who handles business development, and Michael Jr., who manages operations. Photo: Michael Bellantoni Inc.
“The worst thing for me to do is just stop because I’m so active with my lifestyle,” says Bellantoni, who still retains the title of president and CEO of Michael Bellantoni Inc., the full-service, White Plains, N.Y.-based landscaping company he launched in 1963. While he has found time for golf and the occasional vacation, Bellantoni admits he usually put the business first. The “they” Bellantoni refers to are his two sons and the management team he leaves behind. Statistics suggest about two-thirds of businesses handed to the second generation don’t survive, but Bellantoni isn’t worried about the future of his company. Two of his four children have been helping him run the organization for the past several years. His son Matthew Bellantoni is in charge of business development, and his son Michael Jr. is operations manager. Bellantoni retains majority ownership in the business. Over the next couple of years he will transition ownership to his sons. One thing he does want to continue is his work with the larger Green Industry. He’s been a member of the New York State Turf & Landscape Association for 30 years, helped bring certification to the landscaping industry and has traveled around the country helping other states get their testing in line. Bellantoni also has worked with national industry organizations such as the Professional Landcare Network (PLANET), where he mentors others in the industry as a Trailblazer. Bellantoni’s done it for 50 years. He should know. 6. Don’t make promises you can’t keep. 7. Look professional and be professional. 9. Provide best value of service. “That’s the advice I’d give to other people in business,” he adds. Jacobs is a former editor-in-chief of Landscape Management.